Mrs. Mutunga holds advanced diploma in secretarial studies and 30 years’ experience in public sector. 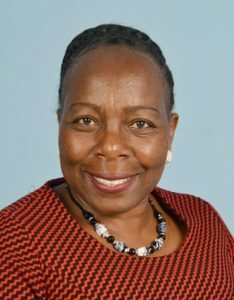 She has consistently offered several services to empower local communities including voter registration campaigns, social audit and baseline survey programs, Mavindini Ward markets information and project awareness and participation in charity initiatives. She has a wealth of experience in audit, human resource and administration which will come in handy in delivering the Municipality mandate. She represents the Urban Areas Association in the Board. Mrs. Jacinta is the chairperson of the Finance, Strategy and Human Resource committee and a member of Audit, Risk management and Governance committee.